Ukrainian Foreign Minister Pavlo Klimkin paid an official visit to Istanbul to meet with Foreign Minister Mevlüt Çavuşoğlu on Friday. The two top diplomats held a private meeting and focused on Russia's aggressive policies in the region, the annexation of Crimea and the situation of Crimean Tatars. Ukraine claims that Russia supplies weapons to the militias that control the Donbass region. 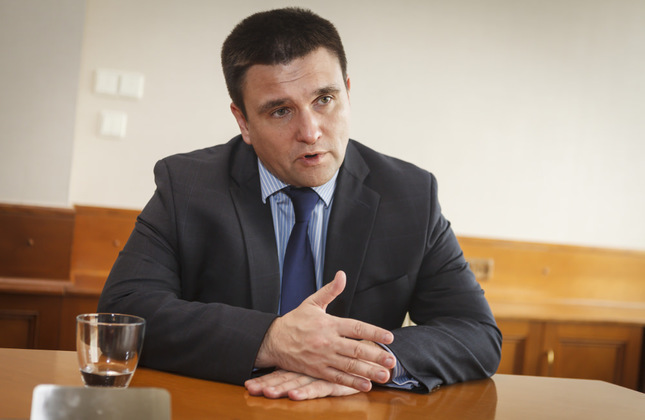 Pavlo Klimkin: No, not at all, because we live in a rule-based world and for everyone it is first about international law, legal abiding commitment and political abiding commitment. Russia has broken both legal and political abiding commitments. We signed the Budapest Memorandum in 1994 and Russia guaranteed respecting our independence and territorial integrity. So Russia breaks all kinds of commitment. You can't follow any kind of sustainable policy if you are breaking political and legal commitments. Secondly, it is about values. What is going on in Donbass is about values. For us, it is about new Ukraine and how we understand it as a unified, democratic and European Ukraine. For Russia it is about destabilizing Ukraine. Donbass is not just about Donbass, not just about Ukraine. It is about global security. Syria is also about global security. So you need to respect international law and all international commitments and should not engage in any aggressive actions. Klimkin: Exactly, that is my point. What is going on in Ukraine and Syria is a challenge and threat by Russia to global security. I can't speak about it. But as Russia has broken international law and its commitments once, what are the guarantees that Russia will not break the law and its commitments again? We live in a world where international law and United Nations principals are key. Ukraine is a non-permanent member on the U.N. Security Council. We have been struggling to make sure that the principals are applied. For the first time in post-World War II history a permanent member of the U.N. Security Council, Russia, is breaking international law and commitments. The international community has to find a way to answer Russia's aggressive policies. What everyone in the civilized world did was important and is important in the sense of continuing political pressure and in the sense of sanctions. Some messages from the U.S. and EU have been given to Russia about its corrupted policies. For me, it is not about one or two messages, but about the narrative. We need to ensure that the narrative is not dominated by wrong policies. Definitely. Sanctions are applied against Russia. The combinations of dynamic for all prices are there and influence Russia. But in our perception, imposing sanctions is neither a strategy nor a policy. It is just an instrument. It is not about breaking the Russian economy but about putting Russia back to implementing the Minsk cease-fire agreement. If you want to implement Minsk, you have to stop firing, shelling, supplying weapons and regular troops and you have to allow humanitarian aid workers to go in, international organizations, prisoner exchange and organizing free and fair elections. Russia has failed to do any of these. Because we have no security on the ground, the shelling continues, we have no access to the areas and we have no progress on humanitarian issues. The people of Donbass have to decide what they want. But only the people of Ukraine who live in that area must make the decision, not the Russians who were brought in with the regular troops. No, not at all. These areas are quasi-Russian ruled. Russia supplies weapons and even troops. 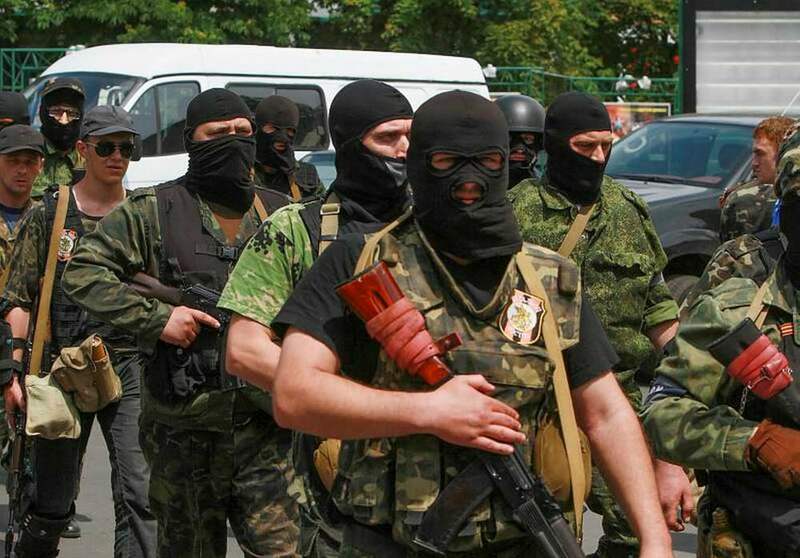 The militias are under Russia's discipline and control of Russian authorities. Donbass has to return to Ukraine, where it belongs, and the people of that area, Ukrainians, must make the decision. Firstly, it is not about recognition policies in Crimea but about the civilized world. Secondly, it is about that there is no link to the area. I don't mean humanitarian links, because we do have and try to help our people. Thirdly, it is about the influence of Russian authorities. We see lots of human rights violations on the ground. There are political prisoners. It is important for Turkey to deal with political prisoners and human rights violations. Turkey, Ukraine, the EU and the U.S. must continue following the developments closely. Everybody has to respect international law. Russian jets violated Turkish airspace many times. It was Turkey's response in the sense of its sovereignty and territorial integrity. Nobody, no jet, no military unit can come to a country and violate international law. It was Turkey's right to defend itself. It is important to fight the terrorist threat in the region. But what Russia has been doing is bombing moderate opposition groups that have been fighting against President Bashar Assad. The international community proved that Assad, who controls now a small part of Syria, has used chemical weapons against his own people. Bombing the moderate opposition is about global security and about the threat to moderate rebels and about causing more refugees. Russia has been bombing areas where civilians live, especially Turkmens. There must be a clear, common vision on fighting terrorism. What Russia has been doing in Syria causes more problems and more global insecurity. We have to stay together against everyone who breaks international law. Now it is Russia who breaks it. Sanctions and political pressure must continue. Any move to stop Russia from breaking international law is important. Under such pressure I am sure that we will find a way to stop Russia from breaking international law and get Russia to respect it. Turkey and Ukraine have to increase cooperation on security issues. There is the Black Sea between us. We have to cooperate more effectively on politics, economy and people-to-people links. Turkey is a unique partner for Ukraine. Our partnership is a cornerstone of security in the Black Sea. Political cooperation, economic cooperation, bilateral trade and educational cooperation will be on the agenda. President Petro Poroshenko will visit Turkey in the near future and meet with President Recep Tayyip Erdoğan to discuss strategic bilateral relations. We have to fight for the future of the region and Turkey has proved many times that it is able to fight. We need to stay together to affect Russia. Our cooperation, as middle powers of the region with global ambitions, is very important. We have to talk about it. There are different ways for such cooperation. We have the Black Sea and a lot of issues.